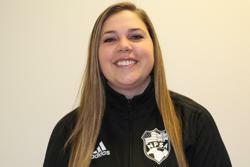 Titans FC is excited to announce the recent addition of Brianna Jackson to its coaching ranks. Brianna comes to the Titans with a wealth of valuable knowledge and experience to her name. As a western Washington native, Brianna was born and raised in Kirkland. After graduating from Lake Washington High School Brianna went onto the University of Washington, where she majored in Business Administration. A life time soccer player and fanatic, Brianna was a standout player during her youth career. As a goalkeeper for LWHS, she was a starter for all 4 years, was First Team All King County, and capped off her career with the King County 4A Championship. Brianna also played for Crossfire Premier, then matriculated to Bellevue College where she played for a while, before turning her natural leadership talents to coaching. Returning to Crossfire Premier, Brianna coached players from three different teams with many of her players going on to play in college. Her success with Crossfire then saw her become a regional director with the soccer franchise, Happy Feet. Brianna made an immediate impact on the business increasing participation by over 500% and her outstanding leadership and coaching skills were recognized by the National franchise, by way of the award “Most Established Director of all US regions”. Brianna will officially take the reins of her teams on May 1st, but she will be on the field periodically until then taking stock of the talent she will have at her disposal. Welcome Brianna and we are delighted to have you as the newest member of our Titan family!